LOS_Photos - Louisiana Garden Club Federation, Inc. 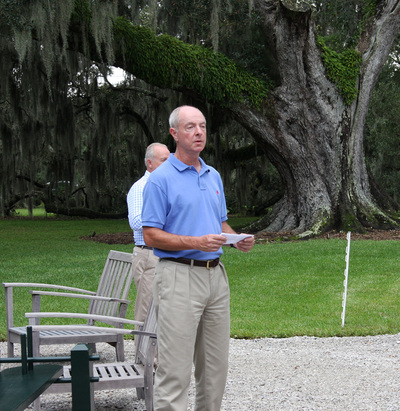 The trees at Oak Alley were inducted into the Live Oak Society in 1995. They are some of the most photographed trees in the world. 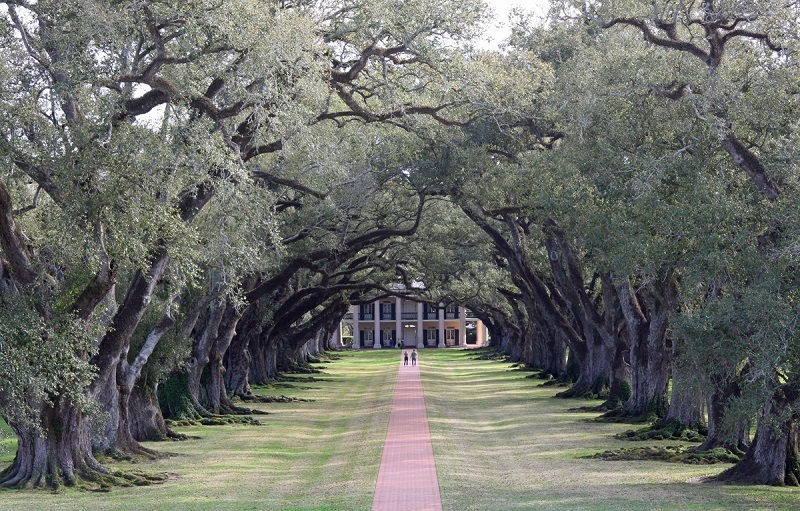 Located in Vacherie, Louisiana, on the Great River Road in St. John Parish, they are thought to be centuries old. LOS registry # 7494 "The Jane Amundson Lafargue Oak"
"The Jane Amundson Lafargue Oak", a memorial oak, measures 23 feet 5 inches in girth. It has survived many hurricanes but also received a lot of damage from Hurricanes. 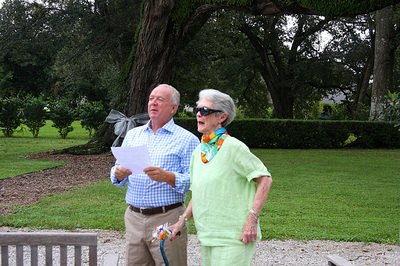 It is on Rienzi Plantation in Thibodaux, LA and was registered by her son, Mr. John Lafargue as an honor to his deceased mother. Dedicated on October 12, 2014 with over 100 people in attendance. The Culinary School at Nicholls State was hired to do the food. Mr. Lafargue had given his mother's eggnog recipe to one of the women chefs and she made divinity fudge with the recipe. 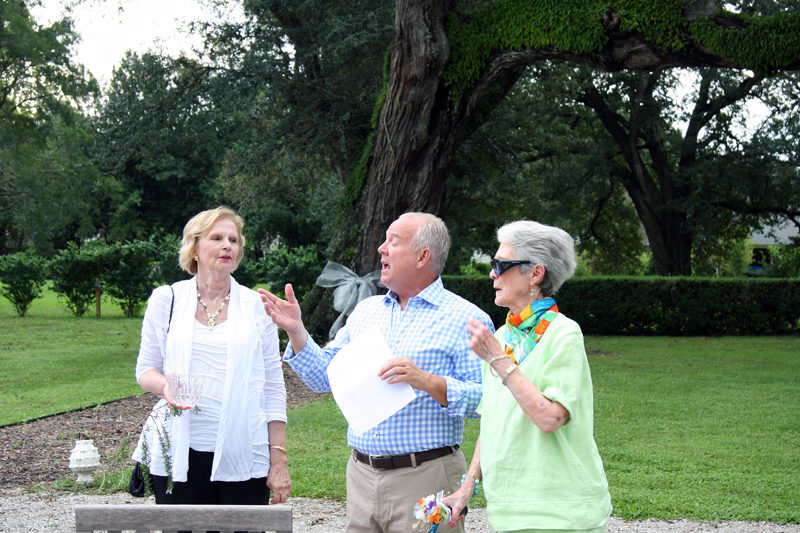 Live Oak Society Chairman, Coleen Perilloux Landry, christened the tree with water from Bayou Lafourche with a branch of Rosemary for Remembrance. "I think that I shall never see." Mr. Norman Lafargue of Shreveport, also a son of Jane's, read the poem "I think that I shall never see.....a poem as lovely as a tree...."
Mrs. Louise Munson Dupont who grew up on Albania Plantation in Franklin, Louisiana was a long time friend of Mrs. Jane Amundson Lafargue and one of the few surviving members of "the bridge club" read the blessing along with John. Notice her cane is decorated for the occasion to match her scarf.